The AG-AF100 is a full HD production camera that supports the Micro Four Thirds interchangeable lens system. The AF100 incorporates a 4/3-inch, 16:9 MOS imager. The camcorder records 1080/60i, 50i, 30p, 25p and 24p (native) and 720/60p, 50p, 30p, 25p and 24p (native) in AVCHD's highest-quality PH mode (maximum 24Mbps). 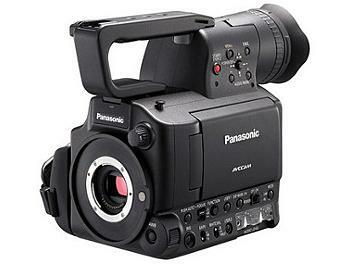 Ready for global production standards, the camcorder is 60Hz (NTSC) and 50Hz (PAL) switchable. The camera arrived in very good time and condition thanks. I had done my research so I knew what I was getting. All good loving it! I was keen from the start to have a af100, but I was reasonably satisfied with the hmc152, although a little soft in sharpness, but the af100 is a much better unit, similar menu layout and functions which has made for a easy transition. Read plenty of reviews and kept an eye on the price. Once ordered delivery was prompt. About the only thing missing is a P2 version(avc intra enabling 10Bit 4 2 2). Hence the price. As attatching an external recorder is about the same cost as the cam body! So a second af100 would seem logical for colour matching, the quality of the codec is that good. But its not a run & gun unit, unless purposely set up. The best things about this cam is its micro 4/3 MOS sensor, ISO range, interchangable lenses(perfect for the GH 2 DSLR that I just got), SDI HD & HDMI, 108024p and variable frame rate. ND dial is a nice touch but awkward position. If you have worked with film cameras then you'll appreciate the af100. I,ve received my Ag AF100 with 45-200 Lumix lense. I can say that Picture Quality out of this camera is perfect , Its Smooth and No Aliasing. Thanks god i don't need any 35mm adapter now & the image is not up sight down anymore. The good thing i love on this camera is PAL / NTSC Switchable & 24P Native Recording. The LCD Monitor is Very Good it give us any details unlike my hvx200A. Love to play with scene files. excellent reseller and excellent item! Thanks to Globalmediapro, I bought this video Panasonic. So I can use my Nikon lenses with an adaptator with iris ring. I must say that the color capture software is one of the best I have seen. The colors come out very rich and soft never flat nor aggressive. Bringing natural effect even for green in every configuration of lightening ( non natural mostly on other manufacturers) and leading to very short post-production work. The advantage for using the top Nikon lenses is evident and avoid the trouble of the "standard zooms" 20X (35mm-700mm equiv 35mm)non interchangeable lens, serial mount on . Such lenses cannot pretend doing everything wide angle and super tele in the same time.